The Frysteland War has concluded and the Exiles have prevailed, maintaining control of that frigid, but vital, outpost. 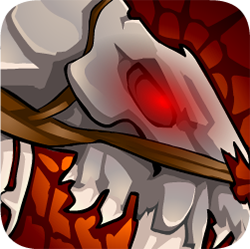 After a few weeks of cooldown, the War will reignite in a much warmer region: The Infernal Mines! This was a close fight, closer than we've seen in awhile. The outcome of the next region will be anyone's guess! 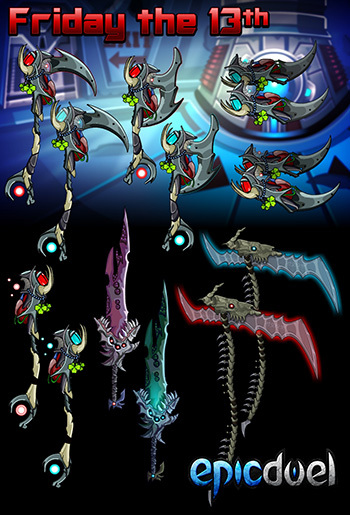 The myserious menace of Delta V, Caden, has just received a stock of interesting new Friday the Thirteenth weapons and items! These limited quantity items, crafted by the most demented individuals in the star system (Guest Artists Theon, Assassin Order, Deuce, and Valoroth) emit a threatening aura of dread destined to strike fear in the hearts of anyone unfortunate enough to be on the sharp end. 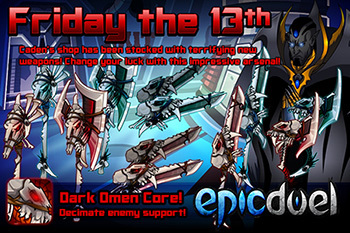 The Dark Omen weapons crafted by the legendary Charfade will come pre-equipped with the vicious active core Dark Omen. This core will cause you to strike your target, inflicting a Curse-like effect, diminishing them in physical size while debuffing Support. Because this skill is similar to the aforementioned Curse core, it cannot be stacked on top of Curse or Curse Aura. These items will be available tomorrow, Friday the 13th, along with the returning Friday the 13th achievement. They will be limited quantity so once they're gone, they'll stay gone until the next Friday the 13th which looks like...January 13, 2017? Yikes! Don't let this opportunity pass!